AGILENT Technologies has announced that its N6030A arbitrary waveform generator, the industry's highest-performing AWG, works with National Instruments' new LabVIEW graphical programming environment. LabVIEW provides instrument control for Agilent's AWG and reduces test program development by eliminating the need to learn text-based programming protocols. This allows users familiar with the LabVIEW environment to rapidly develop test waveforms for their designs. The new LabVIEW driver supports standard N6030A AWG functions according to the Interchangeable Instruments Foundation (IVI) F-GEN specification. It also supports extensions to the IVI-C definition, so users can take advantage of N6030A's advanced features, such as multi-AWG synchronisation and sequencing. 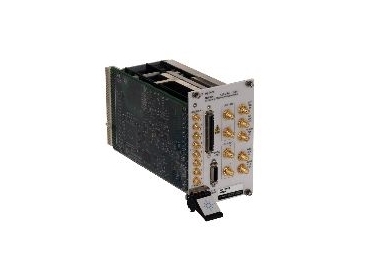 The Agilent N6030A simultaneously delivers 1.25GS/s and 15 bits of vertical resolution, giving engineers who design advanced wideband systems in radar, satellite and emerging communication systems the most realistic, wideband waveforms available. "The performance of the N6030A, combined with the popularity of LabVIEW, is helping our customers easily develop complex waveforms for next-generation defense systems," said John Stratton, marketing manager of Agilent's Advanced Products Operation. "Using our AWG with LabVIEW provides easy integration into existing test environments to minimize software development."